Google released a new app today, which is aimed at offering tips, tricks and troubleshooting help to anyone running a Nexus, Google Play Edition or Android One device, with Android 5.0, Lollipop on-board. The new app offers a number of card based tips, and the ability to detect issues on the phone for which it can automatically suggest ways to resolve them. Although strangely, the app mainly advises you to reboot if you have an issue ‘Have you tried turning it off and on again?’. Making the lack of a ‘Restart Device’ option in the power down menu all the more frustrating. The app is unfortunately not available outside the US, most likely due to one feature offered within the app which lets you arrange for a callback from a Google help representative – possibly taking aim at Amazons ‘MayDay’ help service. The fact that Google has included Android One handsets, which are currently only officially released in India, in the app description is a good sign that Google intends to expand the service elsewhere though. 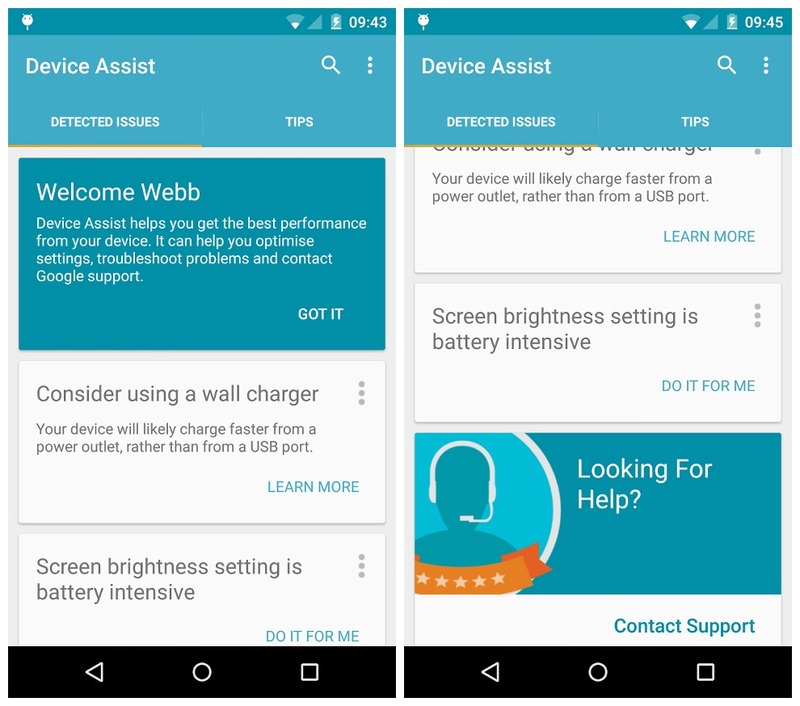 Google Device Assist provides tips and proactive troubleshooting to help you get the most out of your device. Though it is not available through Google Play, you can still install the Device Assist app if you’re willing to side-load. You can download the APK here.